Hello, I hope you all have completed doing your Financial Checkup and the results must have given you an accurate picture as to where you stand today ‘Financially’. In this article I am going to talk about Asset Class…. It is often said that an investor’s portfolio should always be diversified across different asset class. But what is Asset Class? Put simply, Asset Class is ‘different investment options’. It is a combination of individual assets with similar characteristics put together to form a group. 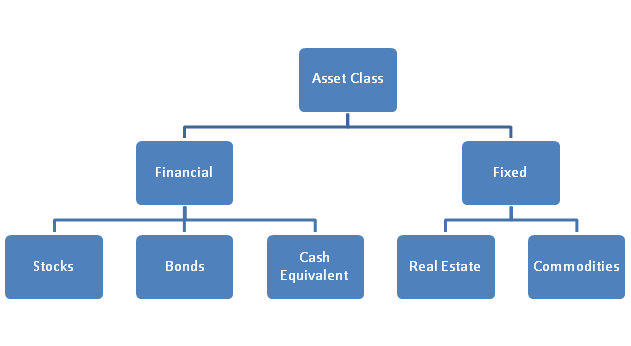 Asset class is mainly divided into two parts namely Financial Investments and Fixed Investments. So as per the chart above, financial investments are divided into 3 main parts. •	Stocks (Equity): Stock or Equity is seen as one of the classic tools for doing investment. Investment in stocks means a person owns a specific number of units or shares in companies. This means the stockholder has an equity stake in Company. Generally, Stocks are seen as one of the long term instruments rather than short term, as they yield highest returns if invested for a longer period. An investment in stocks for short term tends to be high risk investment as it is volatile. •	Bonds: Bonds are normally seen as one of the safest option in investment. It is a debt security. They usually have a defined term or maturity, after which the bond is redeemed. Compared to stocks they are less volatile and return on investment is also moderate. •	Cash Equivalents: Investment in cash equivalents is less risky compared to other two. Investment in Cash and Cash equivalents comprise of Treasury bills, certificates of deposit and commercial paper. But compared to stocks and bonds investment in Cash equivalents gives lower rate of returns. Now Fixed Investments are divided into two parts Real Estate and Commodities. They are actually traditional ways of investment. Real Estate is seen as a good investment option as for example, a rent gain from a flat or commercial place adds to the portfolio. Investment in Commodities means investment in gold, silver or artworks. In India, from generations to generations we have seen people investing money in these forms. So in this article, we have seen different investment options where we can diversify our portfolio. A way to good investment is to diversify portfolio into different asset class or different investment options so that risk is low. Always remember to balance your portfolio according to your needs and goals.